I have been trying to understand why some people find it so difficult to act respectfully towards disabled people, especially disabled adults. I am talking about people everywhere: people who do not have any experience with disabilities; people who have spent many years among the disabled; professionals who cannot see the whole person, only deficits; “advocacy” groups who refuse to stop using the “pity” language; even some parents, who love their children but forget that, by disrespecting us, they are disrespecting their children too. I am trying to understand why ignoring my presence, in my own home, seems to be a visitor’s acceptable behavior. During a state mandatory visit, two nurses came to my home, greeted everyone, looked at me and ignored my presence. They said that the most important thing was the paperwork. Not safety, respect, friendship, health or happiness -- paper. After many weeks the agency supervisor apologized for the offensive behavior, not to me, but to my friend. The nurses didn’t apologize, someone who never saw me did. Many more weeks passed and I got one apology. Only after I demanded one and only from one of the nurses. Why did they think I did not deserve a simple “hello” in my own home? Disrespect. There is also the woman who had just met me and wanted to place her hand on my forehead and pray away my “affliction.” She did not ask me if I wanted that and she did not offer a prayer to any one of the “normal” people around. Disrespect. One doctor refused to talk to me because I “did not understand anything.” Disrespect. A dentist kept referring to me as part of the “low-functioning” group who needed compassion -- after I mentioned my essay “Non-speaking, ‘low-functioning’” and that I don’t like the label. Disrespect. All these people were supposed to be allies to the disabled or at least show some basic manners. Instead, they only showed how they see me: needy, and how they see themselves: superior. The disrespect is also obvious when some advocacy groups paint a disturbing and incorrect picture of disabled people. It seems like we need to be always suffering and sad to be worthy the work of such organizations. That is not respectful. We don’t need their work because we are hopeless, but because society in general is not accommodating or accessible to us. I know that the more dramatic the picture, the better are the chances to get attention. But the individuals running the organizations can, sometimes, show disrespect when dealing one on one with us, and treating us as if we were children. They rarely invite us to give our opinion. That’s disrespect. During a conference, it looked like I wasn’t going to be disrespected. But when the organizers published my words, they changed it. They changed how I identify myself because they like person-first language. They never asked me. The words were mine and they changed them. This is disrespect. And there is much disrespect coming from some parents. When an autistic self-advocate speaks publicly, and well, about issues that affect all of us, they are dismissed and even mocked. They are called “not real autistics.” This is disrespectful. Only because you don’t see their struggles, it doesn’t mean they don’t have them. Some of my friends who are speaking autistics, at least most of the time, who work, go to college, live independently, also have their moments of frustration, they also have meltdowns. Talking about them as if they are not the “real thing” is disrespectful. Maybe they are not having a seizure (some do have them), maybe they are not banging their heads (some did, some still do), they can take care of their basic needs, like showering and eating (some forget about these things), but it is still disrespectful to treat them as not really autistic only because they can, for the most part, manage the particular issues they face. And it is disrespectful to dismiss their advocacy only because they are succeeding as autistics. Some of them were homeless, they were abused and they starved, only because they are autistic. A group of mothers who do not consider successful autistics “real” autistics made a video that ends with: “we want our children to speak.” This disrespects me. I can’t speak. I don’t want to speak. People can communicate in many different ways. Being non-speaking does not make anyone “more autistic,” or a lesser person. What those mothers said is disrespectful to me because I do self-advocate, with great support of my speaking autistic friends, even though I don’t speak. Should I not advocate? 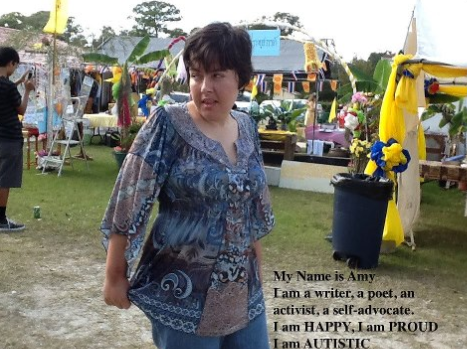 But I am a lot like the autistics in the video, the ones they call “real autistics.” Am I a “real autistic? If they spent one day and one night with me they would see that I am a lot like their children. They are then, disrespecting their children by saying that they can never participate in, and benefit from, the advocacy of other autistics, like the ones perceived to live a life free of real autistic related issues. Respect should not be a privilege assigned to non-disabled only; it should not be a privilege of non-disabled first. Respect should not be only for people who agree with us. Respect is basic civility and kindness. Respect is what we all deserve and what allow us equal participation. Respect is the opposite of baseless judgment. We all deserve to be respected for who we are.